Gift card bonus days are back, but for a limited time only. When you purchase a gift card (purchase here) between December 19 and December 24, 2017, you’ll receive a separate bonus e-gift card for 10% of the gift card value. Many want to know what’s an ideal amount to give since you can give any amount to your loved one. Generally, for a custom shirt, we suggest giving $100.00 to $150.00. 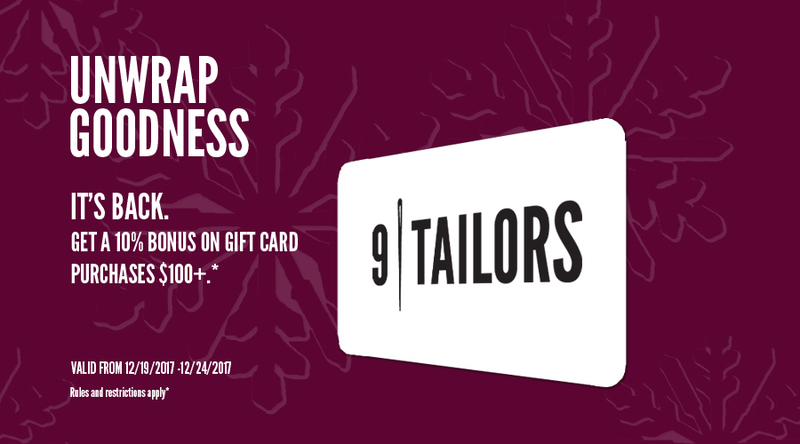 For a custom two-piece suit, we suggest a gift card that starts at $600.00. We’ll be off December 23 – December 25 and again, December 30 – January 1. If you have any questions, you can email us at info@9tailors.com or call us at 617.286.6135. Valid for gift card purchases made between 12/19/2017 through 12/24/2017 at 11:59 EST.